In my last note, I suggested that Anne might have been discussed and commemorated by Elizabeth’s courtiers more than we now assume. I base this on two reasons: first, even if Anne was only occasionally mentioned in the official records of Elizabeth’s court, we have little knowledge of what was said in private. Certainly, Elizabeth was likely not effusive on the subject of Anne, but that does not mean that her mother was not occasionally mentioned. I also sometimes wonder if we do not put an unfair amount of emphasis on the lack of Elizabeth’s official mentions of Anne. Henry VIII did not gush about his mother in the official record, and neither did the majority of English monarchs who came before him. Anne’s position as a mother, after all, is special in our minds for the unique position that her daughter occupied as a female monarch and for the gruesome way that Anne met her end. Of course, the latter is an excellent reason for many not to mention Elizabeth’s mother, especially given the religious climate of the times, but I am not convinced that we should label it as a taboo subject among all of her courtiers. My second reason is based on the number of Anne-related gifts that were given to Elizabeth while she was Queen. The most famous of these gifts is a ruby and diamond locket ring that contained both Elizabeth’s and Anne’s portraits. The fact that Elizabeth wore the ring suggests a very personal commemoration of her mother. Just as interesting, however, is the possibility that the ring was given to her as a gift. In the National Maritime Museum catalogue entry for the ring, it notes that Edward Seymour, the Earl of Hertford, was the likely gift-giver (note that this Edward was the son of Edward Seymour who was a brother to Jane Seymour. Elizabeth recreated the son as an earl during her reign – his emblem, too, was a phoenix rising from the ashes). That the ring was probably given to Elizabeth as a gift is a little known piece of information, but it is news that should not detract from its significance as an item. Indeed, the fact that Elizabeth wore it suggests that she both loved and respected her mother. The ring’s commemorative nature demonstrates that Elizabeth’s courtiers recognized and acted upon their knowledge of the Queen’s affection for Anne. All of the Anne Boleyn-related gift giving suggests that Anne was not a taboo subject among Elizabeth’s courtiers. Indeed, these gifts were, like all gifts given to the Queen, bestowed with the purpose of honoring her and winning her favor. It seems that at least one courtier believed that the way to Elizabeth’s heart was through her mother. Anne and Elizabeth: What Do We Know of Elizabeth’s Thoughts of Anne? Yesterday, we discussed what Elizabeth might have been told by others about Anne Boleyn. While it was clear that there were many who would not have passed on fond memories of Anne to Elizabeth, it was equally clear that there were those who probably shared positive recollections of the Queen. 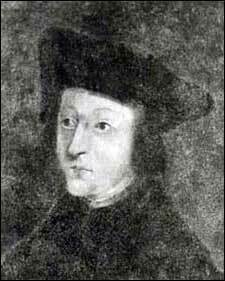 Among them was Matthew Parker, who Elizabeth appointed Archbishop of Canterbury. While on the throne, Elizabeth asked Parker to substantiate the validity of her parents’ marriage. In an excellent article at The Tudors Wiki, historian Nasim Tadghighi discusses both Elizabeth’s request of Parker and her earlier assertion to Venetian ambassadors in the 1550s that she was not “less legitimate than her Majesty, alleging in her own favour that her mother would never cohabit with the King unless by way of marriage, with the authority of the Church, and the intervention of the Primate of England” (Venetian Papers, Vol. VI). I highly suggest you read it here (http://tiny.cc/dta40) as it is an excellent article, but for immediate purposes, know that while Ms. Tadghighi concluded that Anne was a sensitive subject for Elizabeth, she also believed that Elizabeth viewed her mother in a positive light and remembered her in her own private way. I agree with Ms. Tadghighi. Anne was a controversial subject that had to be treated carefully. I sometimes wonder, however, if she was discussed and remembered more often than we assume. The difficulty in determining this is due to the lack of sources we have on Elizabeth’s thoughts and actions concerning Anne. Elizabeth certainly had her own private tributes to her mother. What we know of some of them, however, is questionable. For instance, we can only surmise that Elizabeth’s translation of Marguerite of Navarre’s “Looking Glass of the Sinful Soul” was a tribute to Anne. There is also the claim that after Elizabeth was crowned with St. Edward’s Crown and then the Imperial Crown of England that she chose to wear the Queen Consort’s crown, the one that Anne was crowned with in her own coronation in 1533. However, the crown that Elizabeth chose to wear for a majority of the day could have alternately been one that we know was remodeled for the 1559 coronation. Still, even if the above theories are someday proven to be complete bunk (and I doubt new evidence will ever arise to provide contradiction), we have many reasons to believe that Elizabeth did think lovingly of her mother. For one, Elizabeth was more than amply surrounded by her Boleyn relatives. She did not seek to deny them; indeed, if one looks at the Privy Chamber members who served during the middle part of her reign, eighteen out of twenty-five were related to Elizabeth through her mother. Of course, this could have been a way for Elizabeth to build her own legitimacy. I would argue, however, that the favoritism she showed in one particular case demonstrates that she had a deeper than surface-level dedication to her Boleyn relatives. In the latter part of her reign, troubles with English colonization in Ireland abounded for a number of reasons, and are far too numerous to cover in-depth here. What is important for us to note is that Elizabeth favored her Butler relations in Ireland with a tenacity that bordered on imprudence. The Butlers, of course, were cousins to Elizabeth through her grandfather, Thomas Boleyn. Additionally, it has been noted that Elizabeth’s use of a phoenix rising out of the ashes might have been meant to symbolize her emergence out of the disaster that was her parents’ relationship. One also cannot forget that Elizabeth occasionally used Anne’s falcon badge as her own emblem. Indeed, it was an emblem that others gifted to the Queen, and it is to the subject of gifts that I will turn to in the next installment. Do not think that I have forgotten about the locket ring which held Anne’s image, either; it will be discussed tomorrow! “And hereupon the King began to speak very well of me, and asked the physician two or three times if he had not spoken with me since Easter Tuesday when I was with him. I think he wished to find out what was in my mind after his brusque replies. Although I would not kiss or speak to the Concubine, the Princess and other good persons have been somewhat jealous at the mutual reverences required by politeness which were done at the church. I refused to visit her until I had spoken to the King. If I had seen any hope from the King’s answer I would have offered not two but 100 candles to the shedevil, although another thing made me unwilling, viz., that I was told she was not in favor with the King; besides, Cromwell was quite of my opinion that I should do well to wait till I had spoken to the King.” Chapuys, London, 24 April 1536 (Venice Archives).